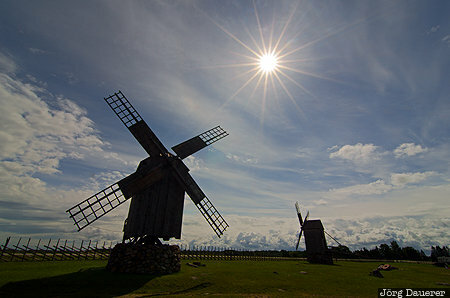 The back-lit windmills at Angla Windmill mountain on the island Saaremaa in the Baltic Sea. The star-burst effect seen around sun was created by stepping the aperture down to f22. The island Saaremaa in the Baltic Sea in the west of the Baltic state Estonia. This photo was taken at noon on a sunny day in June of 2014. This photo was taken with a digital camera.